Is your MP one of the 164 lobbying the chancellor for more FE funding? A cross-party letter has been signed by 164 MPs and handed to the chancellor demanding an above inflation increase to FE funding in the upcoming spending review. Co-authored by Conservative MP Richard Graham and Labour MP Nic Dakin, the letter tells Phillip Hammond that “while government policy has protected the incomes of schools and universities, colleges have been dealt an average funding cut of 30 per cent over the last ten years”. “We believe this constraint on FE resources has had an impact on the teaching, courses and above all opportunities for young people and skills of all ages,” it adds, and describes FE as the “Cinderella” of education spending. 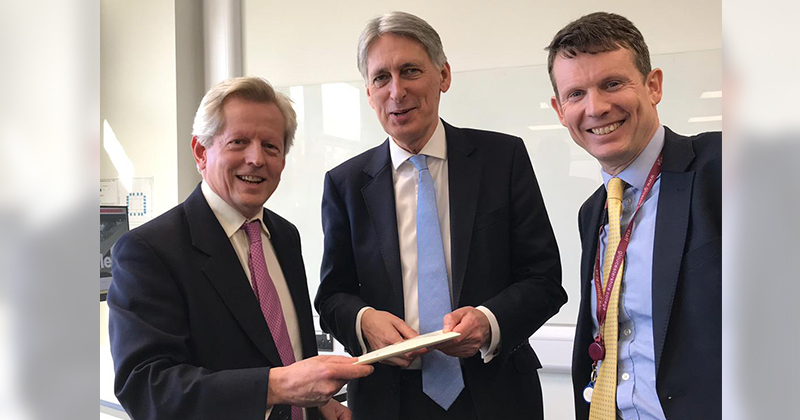 The letter, which was given to Mr Hammond by Mr Graham and Gloucestershire College principal Matthew Burgess on Friday, was backed by 89 Conservative MPs and 72 Labour MPs, as well as two Liberal Democrat MPs and one Green Party MP. It adds that the chancellor’s departmental spending review is a “chance to announce an above inflation increase which would boost skills, productivity and social mobility”. The letter follows two high-profile campaigns to boost FE funding over the last year – Raise the Rate and Love Our Colleges. Both are calling for funding for all 16 to 19-year-olds to increase to £4,760. Funding for 16 and 17-year-olds has been frozen at £4,000 per student since 2013, while per-student funding for 18-year-olds was cut to £3,300 in 2014. The campaigns have been gathering momentum in recent weeks and led to over 50 MPs taking part in a Westminster Hall debate in January when members from all sides of the House of Commons called for an end to six years of real-term FE funding rate cuts. After signing the letter, Mr Dakin said: “From my years as a college principal, I know how important this issue is. Our colleges are the engines of social mobility, transforming the prospects of our young people and delivering the skills our local businesses want. James Kewin, deputy chief executive of the Sixth Form Colleges Association, said: “This year’s spending review is a pivotal one for colleges so we are pleased that so many MPs are backing calls for an increase in funding.